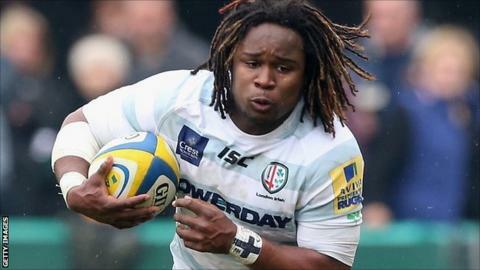 Marland Yarde is aiming to leave London Irish on a high as he prepares to play his last game for the Premiership club. The 22-year-old wing has been with the club since the age of 14, but will join Harlequins at the end of the season. He will play his final game for them on Saturday as they take on Sale at the Madejski Stadium. "I want to go out and put in a big performance not just for me but for my family and supporters and leave on a high," Yarde told BBC Radio Berkshire. Yarde admits it will be emotional stepping out for the Exiles at the weekend for the final time, in a game that is also notable for being Australian full-back James O'Connor's final appearance for Irish. "I'm very grateful for everything the club has given me and it's been a massive part of my life ever since I've arrived here as a 14-year-old," he said. "At no stage did I think I would be leaving and it was a massively hard decision for me to leave in the first place." Yarde's form for the Exiles over the past two seasons has seen him break into the England set up and, having returned from a recent hip injury which ruled him out of the Six Nations Championship, he now hopes to make their summer tour of New Zealand. And he says he is excited about the future and his move to Quins, while also having one eye on next year's World Cup. "The sole goal that springs to mind is the World Cup," he says. "Every player wants to be involved in that. It's a massive thing for me and something I want to build towards. "However, it would be wrong of me to think too far ahead and all I want to do is focus on finishing the season as well as I can and press my claim for a starting spot in New Zealand this summer." Meanwhile, London Irish pair George Skivington and David Paice will combine roles with the Ealing Trailfinders' coaching team for the upcoming 2014-15 season with their current duties at the Exiles.